man, I really am mad at myself for not remembering to include this on my blog and on the flickr photo set... oh, well. glad you posted it here, though. it was so much fun, making this invitation with her... just the whole process... and then the final act of her picking out the stamps, putting them on the envelopes and mailing them to all her buddies herself. now if I could just get her to help me with all the b-day party thank you notes. You guys have one talented family! The invitation and party drawings are so sweet and those photographs are awesome! :) Thanks so much for sharing! WHOA! THis is an awesome card! I love the fact that she got to design it herself. So, will there be an Ava designed Christmas card? Or perhaps a Jenkin's family collaboration Christmas card? This is a great one... and is now my desktop wallpaper. That curl coming off of her head, just above her right hand, absolutely makes the drawing. This kid's got an eye. i'm digg'n that border...nice effect! 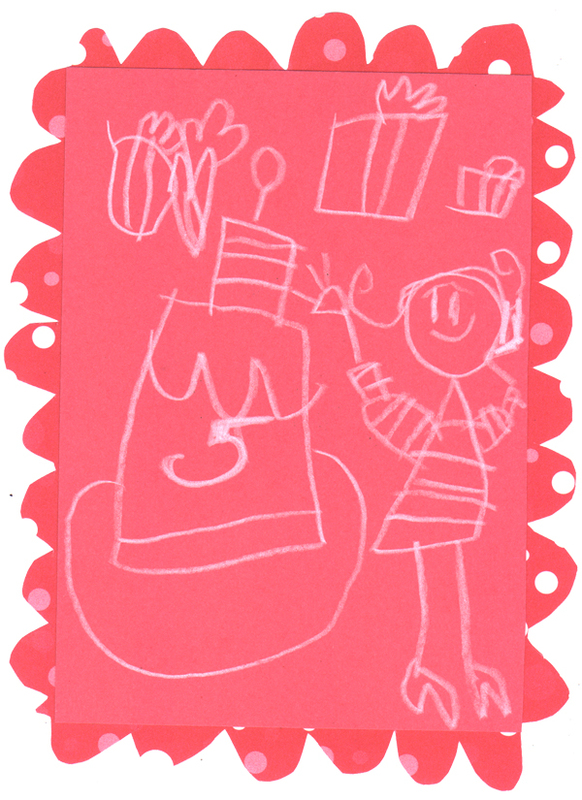 Another cute drawing: this time on a greeting card! Love to see more of that! Wow, Ward, you have a completely photogenic family and home. The photos look like they were plucked out of a National Geographic zip code article! Happy belated B-day to Ava! She's a fantastic artist! Wow, thanks Clio! I really appreciate that! Thanks for stopping by. And Jan, that border was cut out by Andrea, but Ava helped a bit, of course. And thanks for the comments everyone! Ava'll love it.